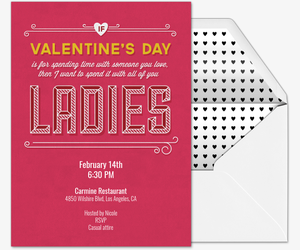 Prepare to be swept off your feet by one of Evite’s digital Valentine’s Day invitations. 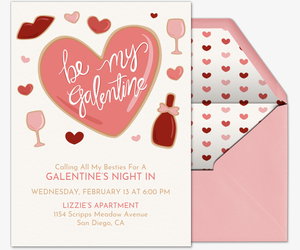 Whether you’re planning a Galentine’s Day party with girlfriends or a romantic evening out with a special someone, Evite has dozens of free and Premium hand-crafted invitations to help set the mood and start the celebration. 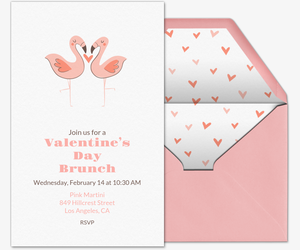 Once you’ve picked your favorite Valentine’s Day event invitation, fill in the details for your event and create a custom message for your guests – for example, suggest a dress code, give details about your party theme and/or let guests know if dates are welcome. 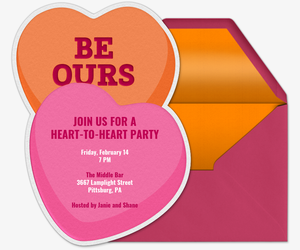 Love freely with Evite’s free Valentine’s Day invitations. Choose from dozens of themes, from super sweet conversation hearts and candy to sophisticated wine and kisses. 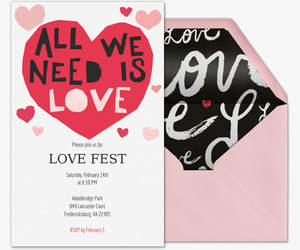 Send one of Evite’s free designs to remind your guests that, just like Champagne, strawberries and friends go “better together,” or go for the gold (and pink) with a glittery “lovefest” invitation. 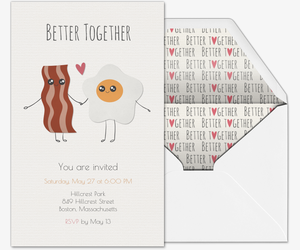 Want to create your own invite? Customize our free upload-your-own templates with your own image. Spreading the love has never been easier! For an extra-special occasion, choose an extra-special Premium Evite invitation. Our ad-free Premium invitations and coordinating envelopes can be purchased at $12.99 for 15 guests, $24.99 for 50 guests and $49.99 for up to 750 guests. Invite guests over for “a night of red and white” or to “eat your heart out” at a Valentine’s dinner party with our themed designs. Or customize your own upload-your-own-photo invitation or design-your-own invitation -- then plan a picture-perfect party to match on ideas.evite.com! Show your appreciation for your soulmate, best friend, parents or crush with a Valentine’s Day card. For Paid Premium Valentine’s Day cards, check out our Valentine’s Day Cards gallery. Discover new ways to show your love with Valentine's Day Party Ideas. Follow our step-by-step DIYs to craft creative gifts for loved ones, from heart-shaped crayons to glitter balloons. Then, get tips from our experts on how to set up a stylish Valentine’s Day dessert table or cocktail bar for your guests. Looking to plan a party but don’t know where to begin? Check out our party guides for helpful planning tips on an assortment of activities, like a Valentine’s Day love fest, crafternoon, gift exchange or single ladies’ soiree. Then get more inspiration from real parties planned by people like you.